Using differential scanning calorimetry (DSC), TEGA will heat soil samples taken from 8 depths to release volatiles, including organics, and measure the enthalpy associated with phase changes [Boynton et al. 1999]. To obtain detailed compositional information, including isotope ratios, a mass spectrometer (MS) analyzes those volatiles correlating their composition to temperature of release. The MS can also sample the atmosphere and directly measure composition, isotopic ratios, and humidity. TEGA will measure the temperature and evolved gas profiles that uniquely identify volatile-bearing minerals. The approach is particularly sensitive to water in the form of ice or mineralogically bound. The TEGA suite of instruments consists of the Differential Scanning Calorimeter (DSC) and a Mass Spectrometer (MS) to analyze the evolved volatiles. DSC with MS: Eight small soil samples will be heated in DSC ovens, and the volatile constituents analyzed in the MS. The power required by the DSC sample oven is continuously monitored during sample heating and compared to that required to heat a similar, but empty, oven. Both endothermic and exothermic phase transitions can be detected. The abundance of volatile compounds associated with the different phases is determined By correlating MS analysis with calorimetry. TEGA can detect the ice abundances on the order of 0.2% of the sample, and calcite (CaCO3) at abundances as small as 0.5%. Organics detection: The mass spectrometer is the analysis tool of choice for organics when their nature is highly uncertain. For highly complex mixtures, a gas chromatograph is normally used to help separate the mixture to aid in its identification, but with Phoenix we use the temperature of the sample associated with the organic release to aid in its identification (along with variations in cracking pattern at different ionization energies). To prevent detection of adventitious organics from Earth, the TEGA cells will be carefully sterilized and tested before sealing. Design & Implementation: In addition to the 8 ovens, TEGA is comprised of a soil acquisition system, gas handling system, and electronics [Williams et al., 1998]. For soil acquisition, the thermal analyzer door is opened and soil falls from the RA onto a slanted, 1-mm pitch screen. Encouraged by a vibrating impeller, fines falling through the screen enter a funneled path to a 2.5-mm transfer port. To ensure complete delivery, the soil mechanism is actuated for ~5 minutes while monitoring the oven-fill LED. If necessary, TEGA can autonomously request another sample from the RA. The TEGA gas-handling system regulates the carrier and calibration gases by pulsing a master valve, and distributes the gases to the ovens via a manifold assembly. The calibration tank contains 60.2% N2, 39.8% CO2, and 1 mL of H2O to produce a saturated vapor. The manifold uses commercially available, elastomer-sealed, normally closed solenoid valves. Prior to use, wax-motor mechanisms puncture nickel foils, which maintain the integrity of the supply tanks. Safety issues with respect to the gas vessels are covered in the Phoenix mission assurance plan. 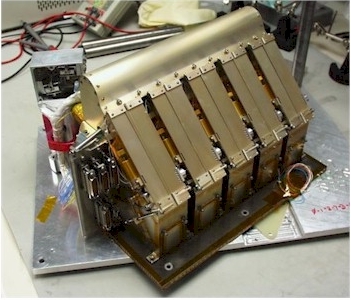 TEGA electronics reside in the payload electronics box (PEB) and the auxiliary electronics box (AEB), which contains sensitive front-end electronics that are located close to the instrument to reduce noise. TEGA uses an entirely digital oven-control system. The TEGA flight software runs on the central lander computer and communicates with TEGA through a bidirectional 9600 baud RS422 communication port on a payload and attitude control interface (PACI) card.